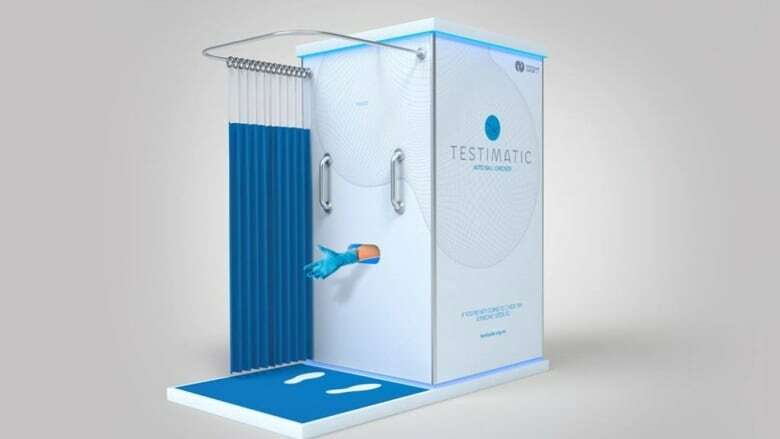 It's called the Testimatic, and it's being hailed as the world's first anonymous testicle-checking station. "[The man] goes in there, pulls the curtain around, drops his pants … and then the hand comes out and checks the testicles," Graeme Woodside, chief executive of Testicular Cancer New Zealand, told As It Happens host Carol Off. The Testimatic is making its debut in Auckland at the Big Boys Toys expo, a giant exhibition of cars, tools, barbecues — and now an anonymous testicle-checker. Testicular cancer is the most common cancer in young New Zealand men. It's also extremely treatable, if caught early enough. According to Testicular Cancer New Zealand, 99 per cent of cases are cured if detected at an early stage. But Woodside said men are often uncomfortable with dropping their drawers at the doctor. That's where the Testimatic comes in. First, the man enters the booth, closes the curtain and drops his pants. Behind a connected wall is a urologist, but the only contact between the patient and doctor is through a small hole in the wall. "There's no eye contact," Woodside said. A gloved hand appears and begins the examination. Woodside said the urologist is looking for signs of testicular cancer: lumps, bumps or swelling. If they find cause for concern, there is a followup conversation in a nearby waiting room to discuss options. If they find nothing out of the ordinary, they give a thumbs up and the test is over. "It only takes 15 to 20 seconds," Woodside said. Woodside said the booth closely resembles a shower, because that is where men should be checking themselves. "We've really tried to replicate and make it a very simple, quick and easy and, as much as we can, anonymous type of encounter," he said. The booth is part of a larger initiative by Testicular Cancer New Zealand to raise awareness of the disease, and normalize regular doctor visits. Woodside said it's also supposed to be fun, allowing the patient to "[get] over his anxiety about firstly dropping his pants and then having a check ... and so he comes out usually with a big smile on his face." While Woodside agreed that the idea of getting checked for testicular cancer in public is odd, he expects the booth to be a hit among young men. "What we are expecting is … they'll take one look at it and they'll immediately think, 'Oh, that looks like a challenge,'" Woodside said. "And even if they don't go and get a checked, certainly we managed to get the message across: 'Guys, you should be checking yourselves regularly.'" Written by Sarah Jackson. Produced by Imogen Birchard.